MARI Extension Pack 4 does not have its own installer but installing it is very easy. 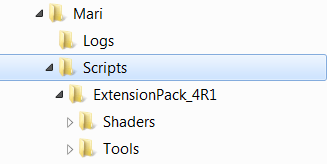 Extract the files from MariExtensionPack_4R1.zip Archive into the Scripts Folder. Please ensure that the ___initExtensionPack___.py file contained in the ZIP File is extracted as well. Please refer to Checking your installation on how to confirm a successful install. Simply extract MariExtensionPack4R1_MaskPresets.zip into the Gizmos Folder. Locate your MARI Installation Directory. Simpyl extract MariExtensionPack4R1_BakePresets.zip into the ModoBakePresets Folder. Simply extract MariExtensionPack4R1_BakePresets.zip into the ModoBakePresets Folder. A new palette should appear in MARI's User Interface with a series of printouts.